Congratulations: you've found The One! Suddenly, there's a ring on your finger and a spring in your step, but before you start planning you're going to need backup to keep you feeling this fine. Every bride's best day is made even better with her best friends by her side, so after he's proposed to you (or you to him!) it's time to plan the perfect way to pop that next question: will you be my bridesmaid? Don't worry- we've got you covered with all the little details to make your bridal party proposal picture perfect. You didn't just pull your bridal party picks out of a hat, you hand-selected your best friends and family members to be a special part of your very special day. Show them how much they mean to you with a personalized present featuring their name, your wedding info, or an inside joke that proves how much they just get you. It's surprisingly simple (and affordable!) to customize cute bridal party favors-- just check out the options available in our shop. 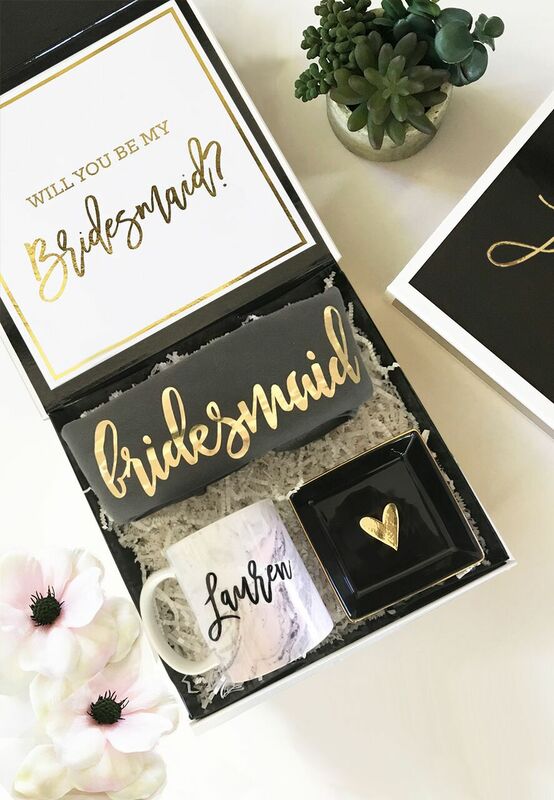 We love the idea of getting beautiful and useful presents and presenting them to each of your girls in a personalized tote bag - or better yet, grab a ready-for-you Bridesmaid Box, customized for each girl but packed and ready to present without any hassle. Offer a Drink (or two) On You! Give your bridesmaid-to-be a little advance pick-me-up for those days she'll be waking up early for dress fittings, or waking up late with champagne hangovers. A small gift card to her favorite beverage place- be it Starbucks, Tea Leaf or Coffee Bean, is a simple but thoughtful way to show your girls you got their back, even when you're in full-blown planning mode. Add a personalized touch and provide a sweet gift card in a personalized tumbler, mug, or travel mug. 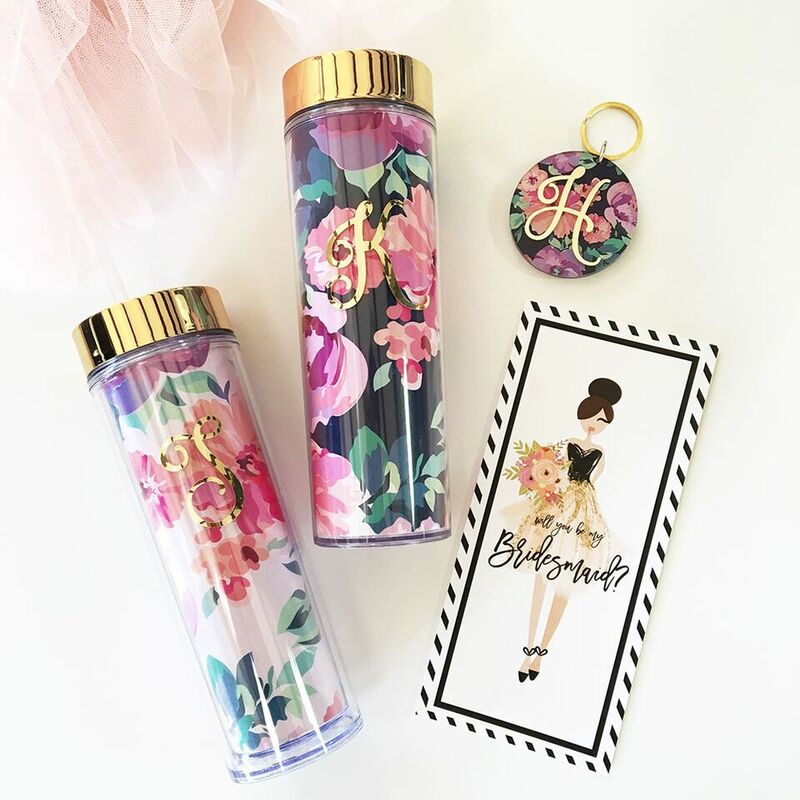 We especially love the beautiful design of our Personalized Acrylic Water Bottles in either Navy or Blush floral. Nothing says personal like actually being there in person. Rather than sending out your asks over e-mail or through phone calls, try and plan a little get-together with your bridesmaids. You can meet one-on-one, or plan a bridesmaids-only party to get the group together and surprise them all at once! This special event is a great opportunity for your friends to get to know each other, talk through the wedding plan, and celebrate your happiness! Asking your girlfriends to become bridesmaids is a big moment in your friendship. It's also a big ask: these wonderful people are going to be a huge support network for you over the next several months. Take the time to write each one of them a heartfelt note explaining why you want them by your side on your big day, and how much you appreciate their support. We love the idea of slipping this note inside a smaller, personalized gift. It instantly makes a sweet and simple gift feel much more meaningful, and your bridesmaids will look at it fondly while remembering your kind words! However you decide to pop the "other" question, remember that a little thoughtfulness goes a long way. Invest a little time towards making the moment special for your bridal party, and you'll all enjoy the memories you make together even more.